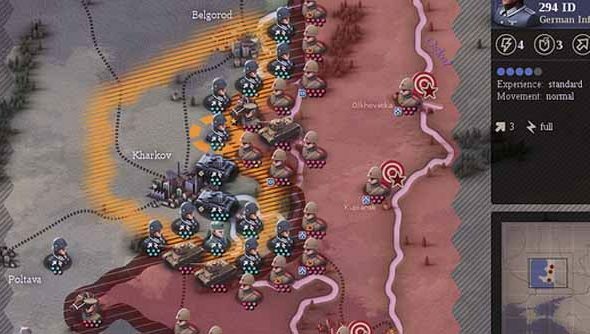 When it was released earlier this year the indie strategy title Unity of Command had players tearing out hair, poring over supply chain tactics, and cursing the AI gods. It’s set to do it all over again with its upcoming expansion. The details of which are below. Here’s a tasty morsel to tempt you over, think Zitadelle, think hypothetical conflicts, think awesome. “Stalingrad Campaign ends in March of 1943, with Manstein’s counterattack (3rd Kharkov) reaching up to about Belgorod. That’s when the Kursk bulge got its final shape. This new expansion kicks off in July 1943, withZitadellewhich is a German scenario (there are only two of those, and no German campaign). We don’t have any what-if scenarios for a hypothetical German victory in Zitadelle, but I’m sure with the scenario editor, the community will offer their ideas about that. Soviet campaign starts withRumyantsevand covers the Soviet 1943/44 campaign to liberate the Ukraine in 8 scenarios. After Rumyantsev it goes toLower Dnieper,Kiev-Zhitomir, etc. Two large scenarios in the middle of Ukraine fighting will let you create theKorsun Pocket,Hube’s Pocketand the 6th Army (again!) pocket around Nikolaev. That arm of the campaign then branches to Romania (2nd Iassy-Kishinev) and Hungary (Debrecen). An extensive addition that takes the two campaigns, German and Russian, into the final stages of the war. Beyond “we’rereally close” there’s no announced release date for the expansion. You could always play the demo or buy the game (again, if you’re familiar with the original) to tide you over till then.